Look for the Proudly Wisconsin Badge when shopping for cheese. Any brand of Wisconsin Cream Cheese, Mozzarella, Parmesan or Young Cheddar can be used in this recipe. Place pizza stone on lower rack in a cold oven. Heat oven to 450°F. Bake stone for 1 hour. Roll out pizza dough into a 12-inch circle, about ½ inch thick, on lightly floured waxed paper. Brush with olive oil. Spread cream cheese mixture to within 1 inch of edges. 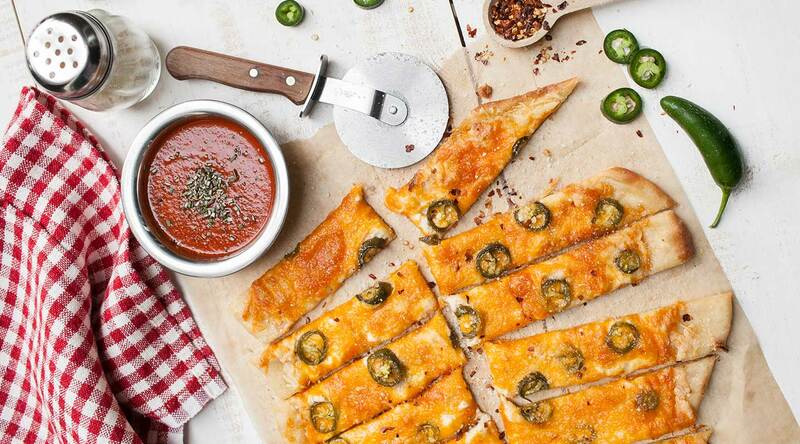 Layer with the mozzarella, cheddar and jalapenos. Transfer dough to pizza peel. Carefully transfer to pizza stone. Bake for 18-20 minutes or until cheese is bubbly and crust is golden brown. Remove pizza from oven; transfer to cutting board. Cool slightly before cutting. Serve with parmesan, red pepper flakes and marinara sauce if desired. Avoid touching face when handling the jalapeno peppers. Consider wearing gloves, as oils may burn skin. For less spicy heat, remove seeds and membranes from jalapenos before slicing.